Volvo wagons have historically been popular among the environmentally conscious set, despite the fact they've never been that fuel efficient. Of course, that's what you get when you're powering such a heavy brick. 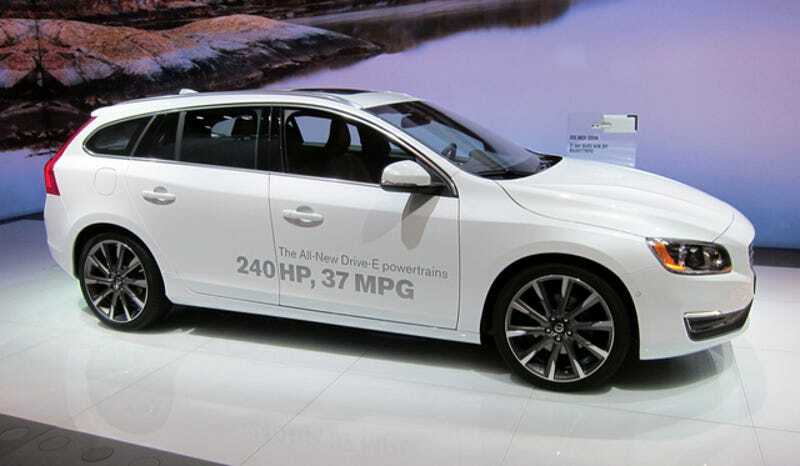 But the 2015 Volvo V60 is different. Not only is it curvy and pretty, it's also very easy on gas. Unexpectedly and without much fanfare, Volvo announced Monday at the Detroit Auto Show that it had fuel economy figures for the 2015 V60 T5, the first Volvo in the U.S. with its new family of Drive-E turbo fours. Volvo's SVP of marketing Alain Visser announced the T5-engined wagon is rated at 37 MPG on the highway, and 29 combined. Impressive, and short of diesels it's best among the wagons. And in the S60, it beats anything that isn't a hybrid or diesel. The T5 also comes with 240 horses, 10 short of the old five-pot T5, but it's a bit lighter. An extra 7 MPG on the highway is worth the power sacrifice in this case, I think. It's FWD only, for now, so live with that. Another treat on the Volvo stand is the XC60 T6, with that new turbo-supercharged version of the Drive-E. It makes 302 horses. Sure, it's front-wheel drive but that lets it get 30 mpg highway. As far as midsize crossovers go, that sounds like a good tradeoff between fastness and fuel savings. And as far as auto show surprises go these days, Volvo's MPG figures were most pleasant indeed.